Among the artists who came of age in the 1950’s and 1960’s, Wolf Kahn chose not to work in the prevailing abstract mode, but instead concentrated on representation, particularly if the landscape. Kahn’s remarkable work in this vein emphasizes color – at first in austere, tonalist images, and later in brilliant, high-keyed paintings that have established his reputation as one of the most important colorists working in America today. Although Kahn is best known for his oil painting, knowledgeable collectors particularly prize his work in pastel, an opulent medium that has offered the artist a rich, expressive vehicle for his eloquent technique. Here, in a series of thoughtful essays, Kahn discusses his work in this medium, considering its sensuous appeal, its expressive capacities, and its technical problems, and explaining the world of possibilities that it presents to the mature artist, the student, and the sensitive viewer alike. The noted art historian Barbara Novak has contributed an introduction that discusses Kahn’s pastels and paintings in the context of the historical evolution of American art, and of the art of our time. Lavishly illustrated with Kahn’s own work, Wolf Kahn Pastels promises to be an invaluable source for professional artists and students alike, and a delight to the eye of the many lovers of Kahn’s art. 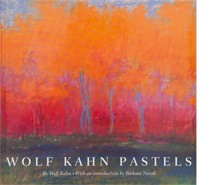 Wolf Kahn Pastels/by Wolf Kahn; with an introduction by Barbara Novak.